You should read the page about the rotated-point, circle plan houppelande if you are interested in the theory behind this construction. This page only covers construction of one in more depth than on the theory page. 3 yards of fancy fake mink at 62" wide ($15/yd) see note on mink below. 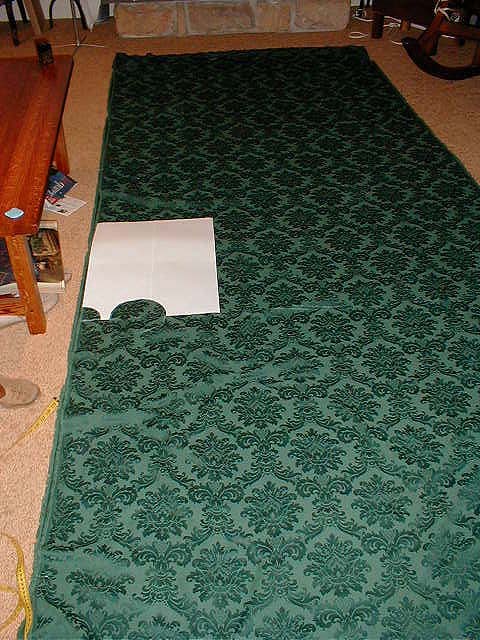 The hem is 14 yards around. The train is 4 feet from my feet; the rest of the hem is one foot longer than the floor. 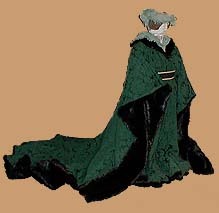 Note: the lighter green dagged thing around the neck area is the tail of the hat, not part of the dress. Although the tapestries show women helping hunt in these dresses, mostly they're standing around looking cute. If you want to do anything other than stand around looking cute, don't have a train, and don't have sleeves that drag on the floor. 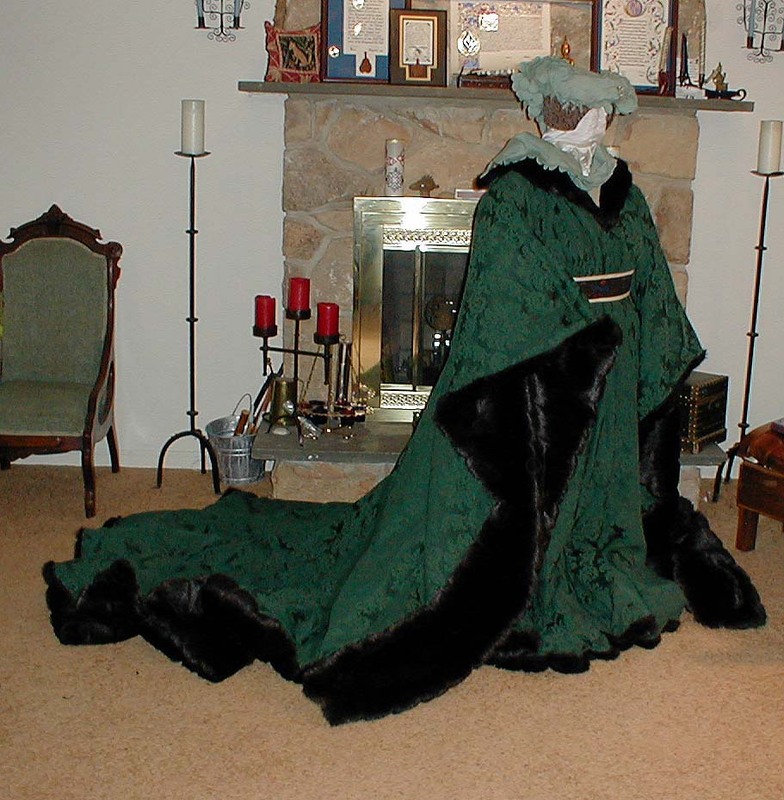 My other houppelandes do have hems about a foot longer than the floor; these are not difficult to dance in or walk in, with a little practice. The sleeves are bag sleeves or don't drag. And the fabric is a little lighter weight. I heard the word a couple months in advance: the Eastern Laurels had decided that I was worthy to join them. What a great excuse to make the houppelande I'd been plotting: a houp with a train, and sleeves that dragged on the ground, just like in the Devonshire Hunting Tapestries. I should note that the line drawing above is one from the tapestries -- which has a shorter train than many in the set. The hat is the first truly silly hat I made (stuffed rolls not counted) which I reworked. 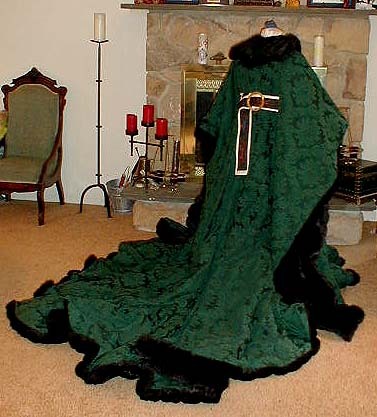 Choice of fake mink: One of the major arguments for fake mink in garb is that it is designed with join lines to imitate where the pelts are sewn together -- a feature missing from all other fake furs that I have seen. Although it represents a N.Am animal, I think this added realism nearly balances the equation the other way, as there certainly aren't European animals which have pelts so wide that they never need joining. Other small animal furs native to Europe and larger fur animals would look more like the fake mink than like vast swaths of undifferentiated fur. Overall shape: First I had to look at the tapestries and take notes. I measured how long the trains were relative to the women's bodies. I estimated how long the hems were. I looked at the way the sleeves hung, and how long. Then I converted notes such as "train as long as from feet to bust" into measurements that fit me. The sleeves were an interesting puzzle. 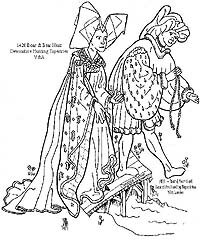 Modern fitted sleeves with a back seam and the S-curve at the sleeve top, produced no fullness near the shoulder, but the tapestries seemed to have fullness there, without obvious pleating into the armscye (ie, armhole.) So I tried an absolutely straight sleeve top -- no shaping; just like half an oval with the flat side to the armscye. I liked the way it looked, so I went with this simple solution. 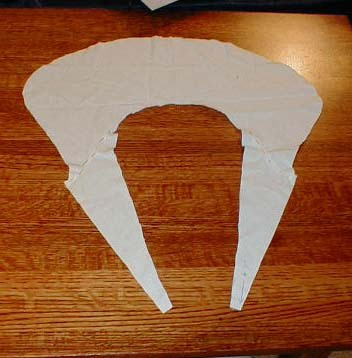 Paper pattern for the shoulder cut out and the armscye. Armscye should not be a half-circle, I discovered. It should only be a slit in the seam or the fabric. See the main circle houp page for details. 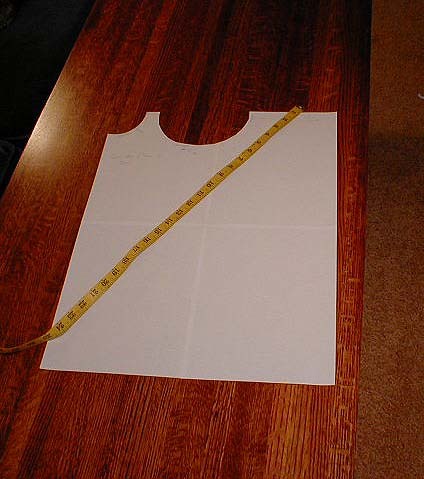 Pattern laid out at shoulder location on fabric. 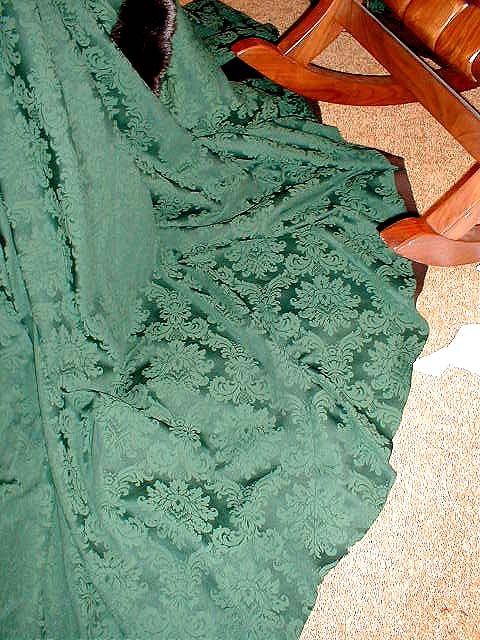 Be sure that if the fabric design has an up or down, that you've got right sides together and going the right way. 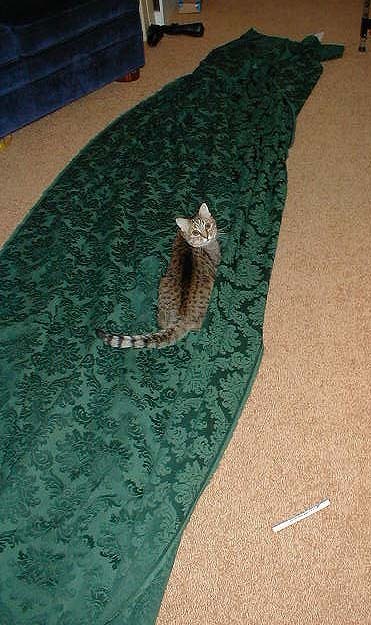 The perils of cats and sewing. 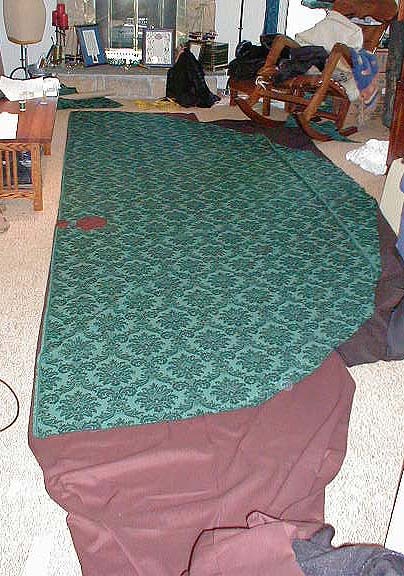 The cut body fabric laid out on the lining fabric as a pattern for the lining. 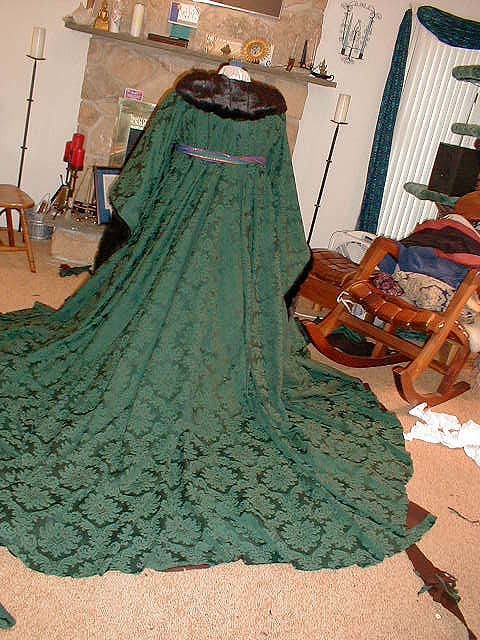 You can see the half-oval "wheel piece" on the right, where the fabric was not wide enough at the sides and was extended. Likewise, the brown lining had to be extended with a darker brown piece. 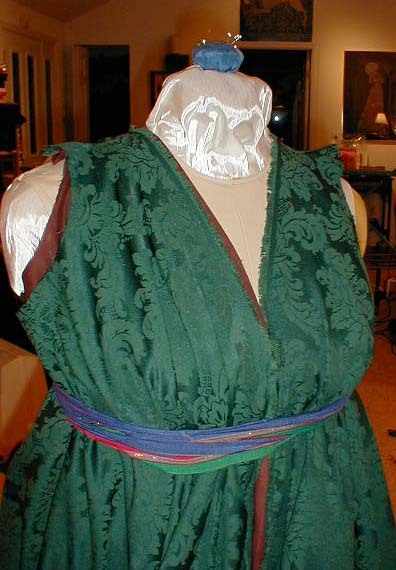 The two 'holes' near the middle are the curve for the shoulder seam and the armscye. 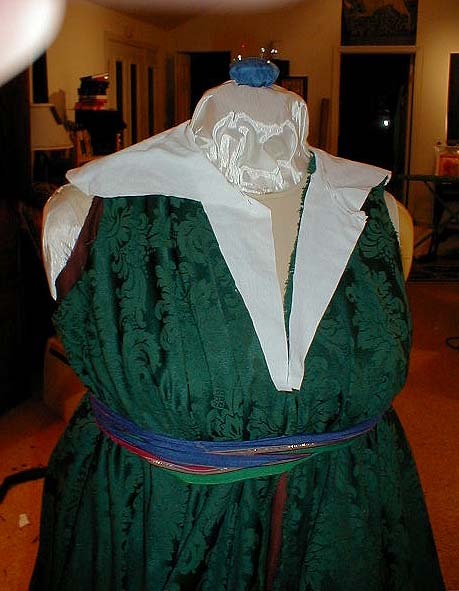 Working on draping the collar. I wanted one that would look like the straight-edged 'peter pan' collar and, when open, make a nice V like others in the tapestries. 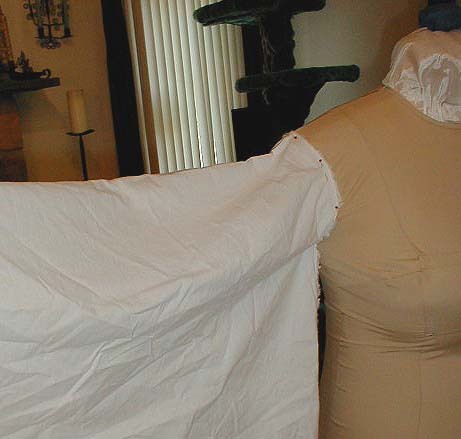 The near side of the muslin is closed, as if meeting the far side, which is in the open configuration. Selvedge edges. Note the rise at the armscye. This goes away if there is no cut out for the sleeve, but only a slit. Shape of the final sleeve. Trimmed edge, theoretically, the lining and the good fabric are now identical. You can just barely see the pressed seam for the wheel piece -- start at the lower edge of the picture and follow the hem up about half an inch on the screen. Finished houp from the back. 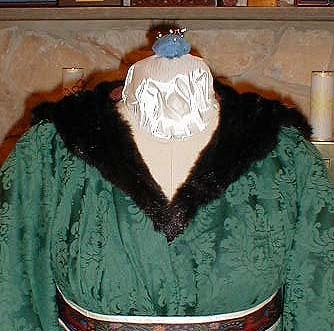 The sleeves are fully lined with the fake mink. 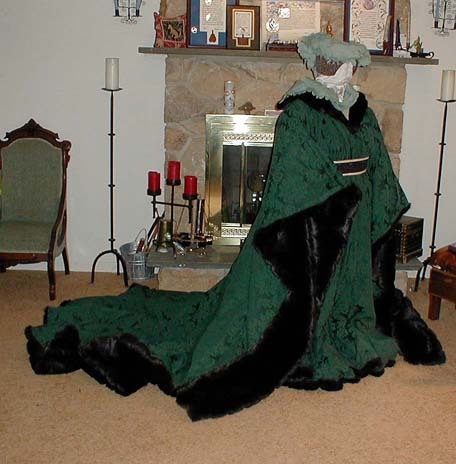 The hem has a 14" fur border on the lining, made up of 7" of mink and 7" of plain black fur. The mink, of course, is at the edge where it is more likely to show. 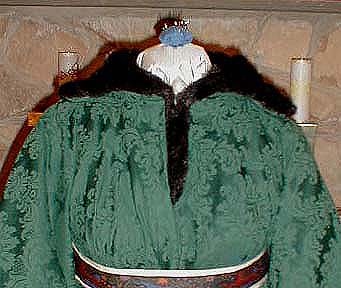 From the tapestries, I believe the fur they used was thinner than the mink, probably similar in thickness to medium or light rabbit fur.